Catch a winning promotion with this fishing theme kit! 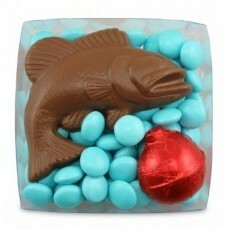 4.32 oz Clear box filled with 1 chocolate fish, 1 chocolate foil wrapped bobber and 2.9 oz of Colorific Chocolate Bites. Fish and bobber available in all four flavors; mix and match flavors for no additional charge. Colorific Chocolate Bites available in milk chocolate only. Coordinate ribbon to match corporate or theme colors.